As reported by a number of news outlets and Fox News, the Mall of Louisiana had to be evacuated when a flash mob of local teens got out of control. Many of the teens were African-American. So one wonders whether Fox Radio and Fox News conservative, Christian, culture warrior and “gun toting, chicken eating son of a Baptist" Todd Starnes' rather cryptic tweet about the incident suggested some racial bias - unlike his 2011 Tweet, "Blacks Riot at Burger King," which was clearly racist. While we can't say for sure that Todd's lack of "surprise" about the incident was because the perpetrators were black, we can say that at least one of his Twitter followers just might be a racist! Todd doesn't seem to have a problem with his follower's bon mot. 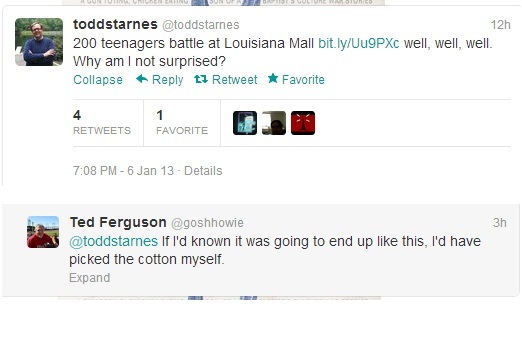 And from Starnes Facebook: "200 teenagers battle at Louisiana Mall. I suspect President Obama will not be calling for a national conversation on this particular issue." He was expecting 200 teens to brawl at a mall?! Racist or not… that’s still kinda messed up.